The concept behind holistic health care is that the body should be viewed as a whole structure and not regarded just as a collection of individual parts. All systems within an organism are connected with one another in some way, and any imbalance may disrupt other body systems before physical signs are seen. All aspects of a disorder should be considered in the planning and implementation of a treatment regime, as opposed to treating only the apparent clinical signs themselves. For example, a dog that suffers from chronic skin irritation, ear infections, or chews incessantly at his feet, should not just be treated with steroids, antibiotics, or topical applications. The cause should be determined and addressed. Foot-chewing and chronic ear infections are classic signs of food allergies in dogs. Often, a simple change in diet combined with support for the immune system, will rectify the problem within days. Viewing the body as an inseparable structure, and treating the cause of disease (as opposed to “splitting” the body into its individual parts and trying to treat only the visible signs), allows that body, which is fundamentally sound, to return itself to normal. 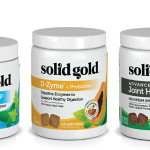 Solid Gold selects ingredients from around the world to produce foods and supplements, which can be used in conjunction with each other. 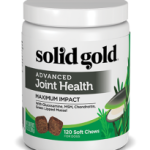 This promotes a healthful whole body, whose systems work in harmony and are enhanced to their maximum potential.